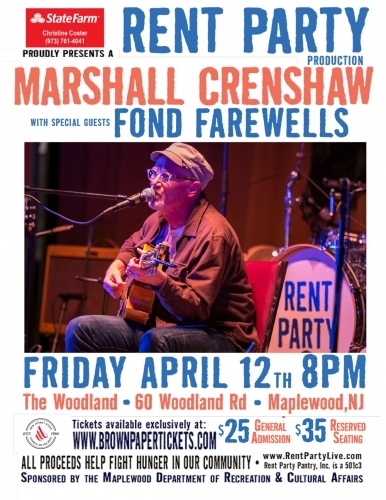 We are just delighted to welcome back Marshall Crenshaw to the Rent Party on stage with special guests Fond Farewells! Born in 1953 in Detroit, Michigan, Marshall Crenshaw learned to tune a guitar correctly at age ten and has been trying ever since. His first big break came in 1978 playing John Lennon in "Beatlemania", first as an understudy in New York, then in the West Coast company followed by a national touring company. Removing himself from that situation in Feb. 1980, Marshall settled in New York City. After crossing paths with the great and legendary Alan Betrock, Marshall recorded his debut single "Something's Gonna Happen" (for Betrock's Shake Records label), which led to a deal with Warner Bros. His debut album, Marshall Crenshaw, was acclaimed as a masterpiece upon its release in 1982 and established him as a singular songwriter, record maker, and guitarist. The album spawned the hit single "Someday, Someway," and other classics such as "(You're My) Favorite Waste of Time", "Whenever You're On My Mind" and "Cynical Girl." Tickets at Brown Paper Ticket only!